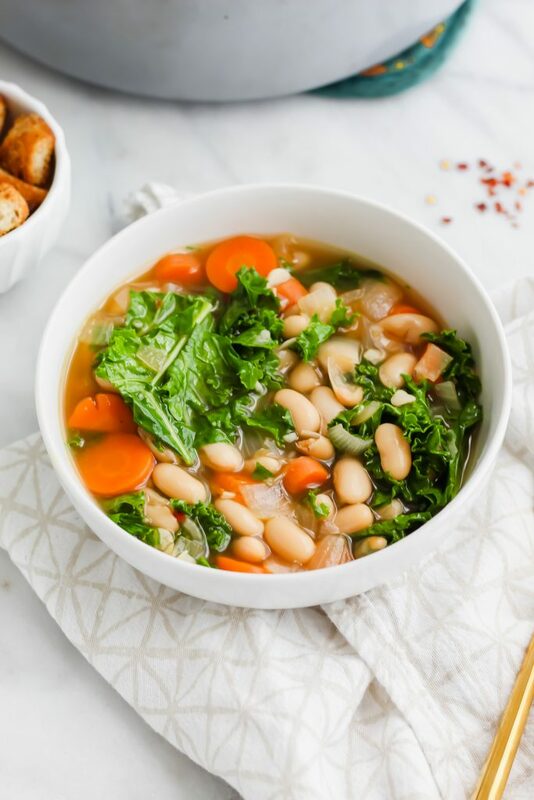 This Tuscan White Bean Soup is the perfect nourishing soup to warm your soul! 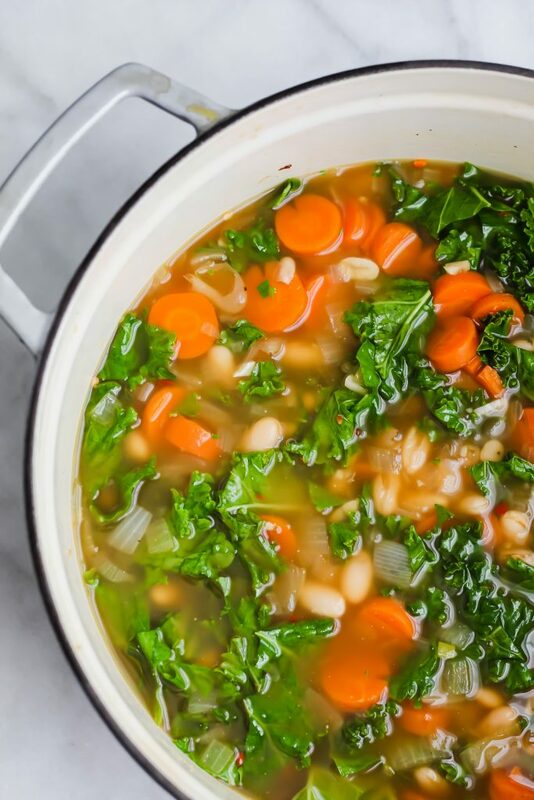 Filled with ingredients like cannellini beans, superfood kale, carrots and tons of fresh garlic. 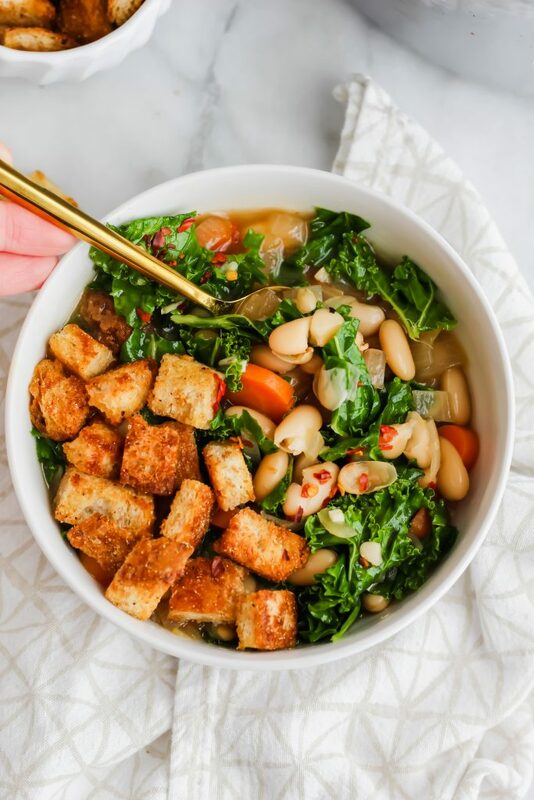 Top it with garlic bread croutons and you’re all set! I just have to be honest with y’all. Today was 75 degrees in North Carolina. In the first week of February. Crazy, right?! 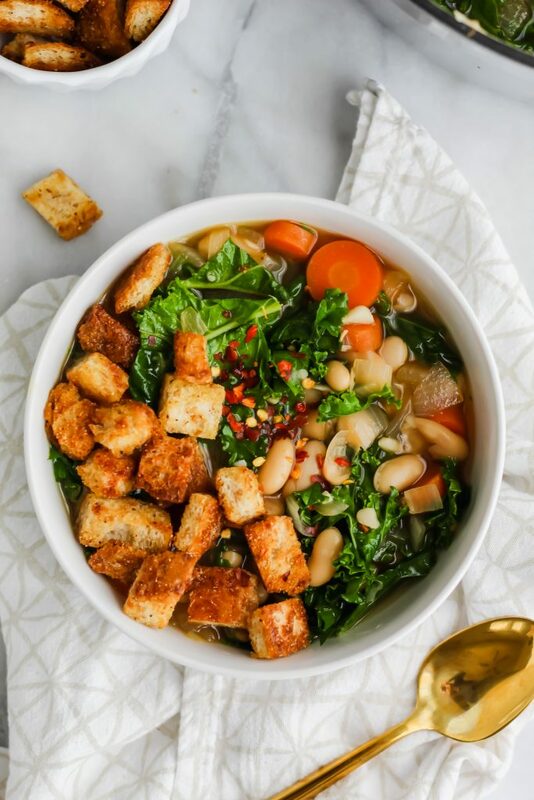 So, I made this comforting, warming, delicious Tuscan White Bean Soup and I ate it outside while I was basically sweating from this random heat wave. Good times! But really, I wasn’t sure that I was going to super *loveeee* this soup when I was recipe testing it because it doesn’t have usual ingredients that I use. Unlike my Chicken Pot Pie Soup, or my Thai Green Curry Soup, this soup is completely vegetarian. In addition, it uses cannellini beans – whereas I’m usually a black bean fanatic. 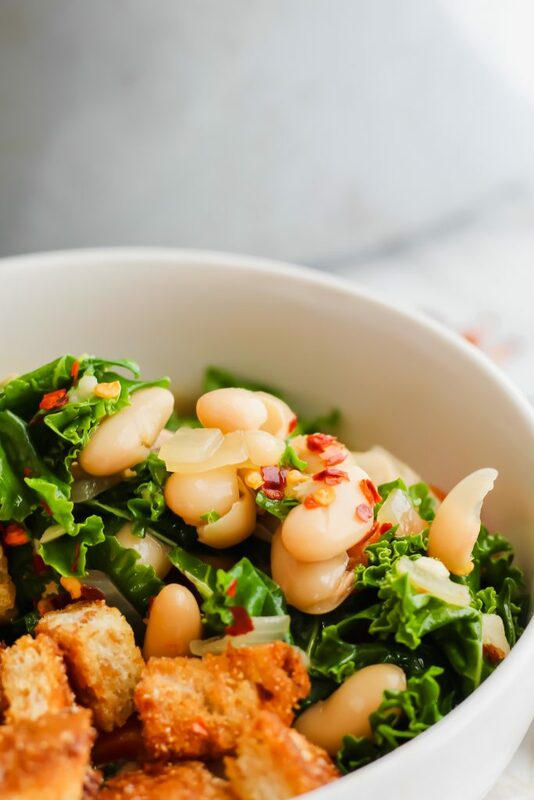 Lastly, it uses that one leafy green vegetable that everyone seems to love: kale. Dun dun dunnnnn. But y’all. I was wrong. This soup turned out to be phenomenal. It’s the perfect nourishing and comforting soup. It’s extra savory and slurpably delicious. I love how the carrots remain soft, sweet but still have a slight crunch to them. 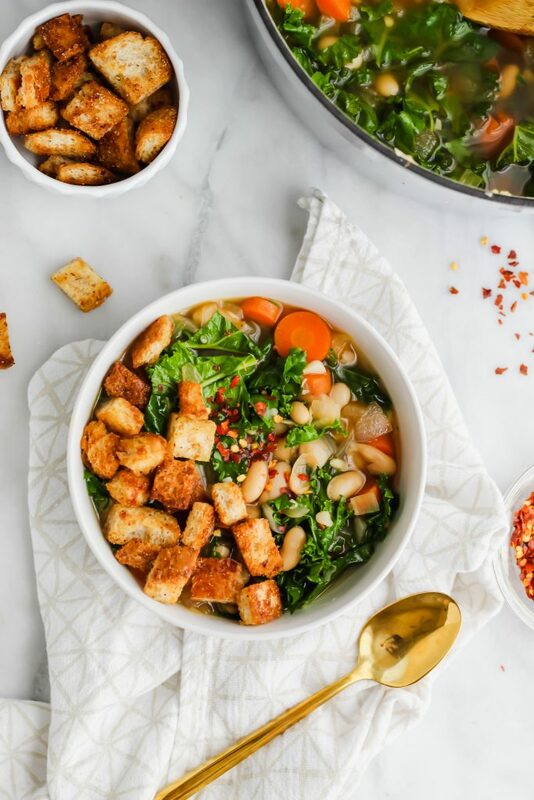 But let’s be honest – the best crunch comes from the HOMEMADE GARLIC BREAD CROUTONS. Oh yes, I went there. They’re crunchy and addictive and all I’m saying is you better cook them immediately once your soup is done or else you’ll be like me and snack on them while said soup is cooking and barely have any left. The cannelini beans are super duper light, buttery and delicious. The fresh onion and garlic round out the savory goodness of the soup. And the kale; oh the kale. I actually ended up LOVING the kale. It’s slightly bitter – so it really balanced with the sweetness of the carrot and onion. It was earthy but not like *toooo earthy* if you know what I mean? It was perfectly wilted and delicious. Okay, you probs get the point. Let’s get into how to make it! As usual, I find it best to prep all of your vegetables ahead of time. So, chop the carrots into coin bite size pieces. Dice the onion finely. Mince the garlic finely as well. Set these aside. Using a large pot or a dutch oven, add about a tbsp of olive oil on medium heat. Let it get hot and then add in the carrots and the onion. Add salt and pepper to taste and let it cook for about 4-5 minutes, until the carrots begin to soften. Once that’s done, to the pot, add in the minced garlic. Stir and cook for about 1 more minute, until the garlic is fragrant. To the pot, add in the vegetable broth, 2 cans of cannellini beans, thyme and red pepper flakes. Stir around to mix everything together. Let this simmer for about 15 minutes on low heat. Once it’s simmered, add in your de-stemmed and roughly chopped kale and mix together. Let the kale wilt for about 2-3 minutes. Adjust seasoning if necessary. From there, you’re all set! Top with extra red pepper flakes and the garlic bread croutons! 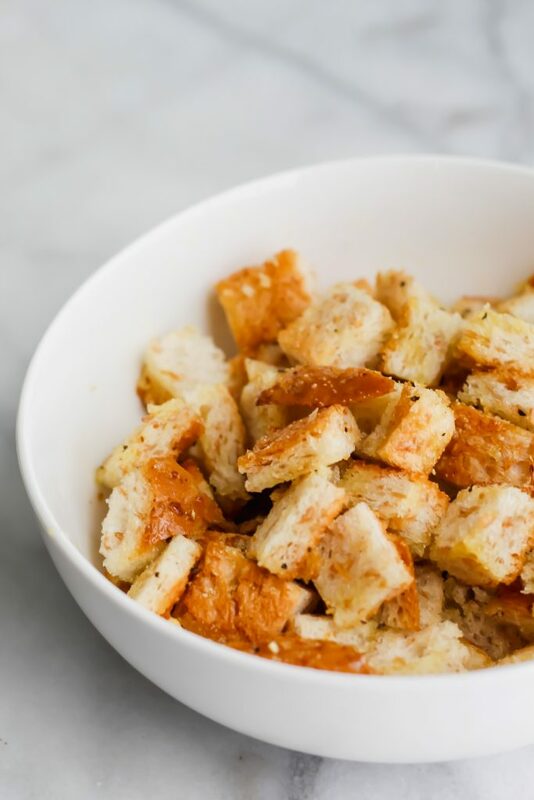 Because every good soup needs a crunchy topper, here is how you make the garlic bread croutons. Preheat your oven to 350. Using 2-3 large pieces of stale bread, cut them into crouton size chunks. In a bowl, combine the bread pieces with olive oil, garlic powder (a generous amount) and salt and pepper until each piece is well coated with the mixture. 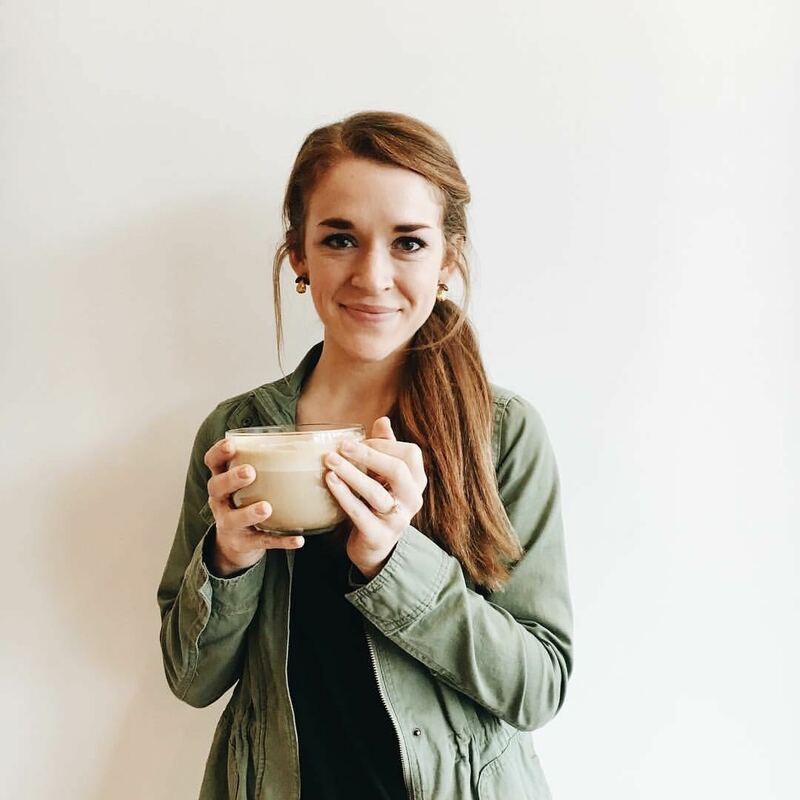 This Tuscan White Bean Soup is truly the bomb diggity, y’all. If you try it, make sure to load up with those garlic bread croutons and red pepper flakes. I hope y’all enjoy it as much as I do! Begin by chopping the carrot into bite size coin pieces. Dice the onion. Mince the garlic and set all of this aside. In a large dutch oven or pot, drizzle a tbsp of olive oil and let it warm up on medium heat. Once warm, add in the carrots and onion. Stir around and let the oil coat them. Let cook for 4-5 minutes, until carrots begin to soften. Once the 5 minutes is up, add in the garlic and cook for an additional 1 minute, until garlic is fragrant. To the pot, add in the vegetable broth and the 2 cans of beans as well as the thyme, red pepper flakes and salt and pepper to taste. Let this simmer, uncovered, on low heat for about 15-20 minutes. Once simmered, de-stem and roughly chop the kale. Add it directly into the pot and let it wilt for about 2-3 minutes. Adjust seasoning if necessary by adding more salt and pepper. Top with more red pepper flakes! While the soup is simmering, preheat your oven to 350. Chop 2-3 (depending on how many croutons you want) large slices of bread into bite sized crouton chunks. In a large bowl, add the bread pieces, 1-2 tbsp of olive oil (enough to coat bread) and the garlic powder and salt and pepper. Mix until fully coated and combined. Once coated, add in a single layer on a baking sheet. Bake for about 10 minutes, stirring and flipping halfway through until the croutons are golden brown and crunchy. Top your soup with these! The kale is an excellent add. I wasn’t too sure but once I tried it, it adds plenty of flavor! So tasty, and perfectly balanced! Especially nice for these cold NC evenings! 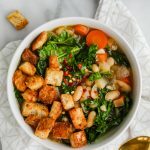 My husband isn’t a big kale person, but he absolutely loved this soup – with extra red pepper flakes for maximum spiciness, of course! 🙂 Thanks, Haylie! 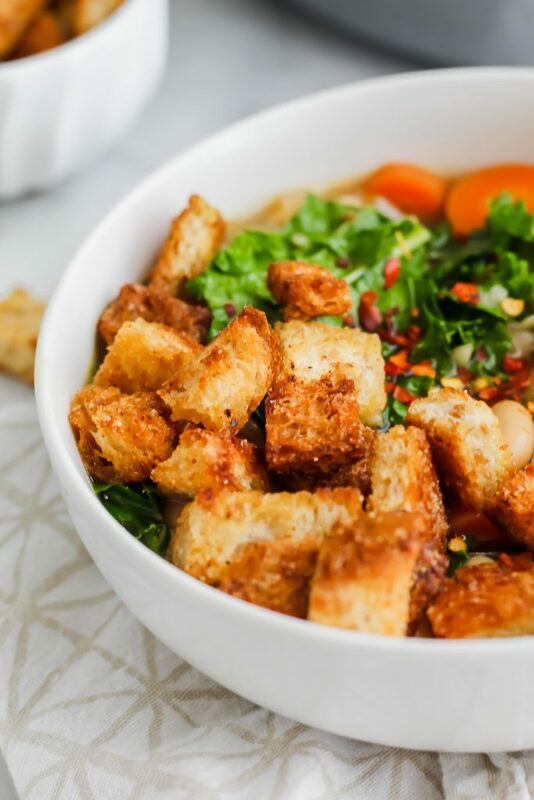 Garlic bread croutons are like the most brilliant idea ever. Like why have I never thought of that? Thanks for being so ingenious, Haylie!